Hey look! It's like a metaphor for those "Moral Choices" I keep hearing about in video games these days. 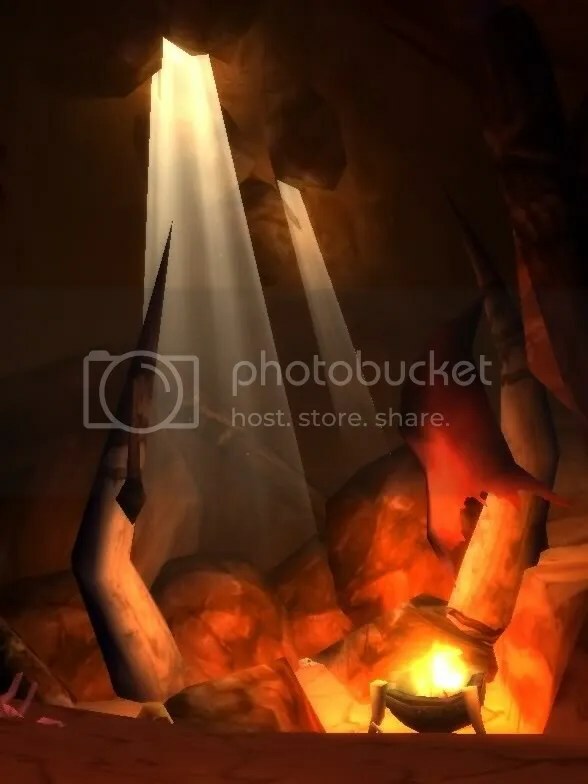 The Horde, in their foolhearty attempts to gain an edge in the Night Elf dominate lands of Ashenvale began digging deep, too deep, and they accidentally opened a portal to HELL! Just like in Doom. Which is why there are demons all over Felfire Hill and Demon Fall. It is no coincidence that Mannoroth used Ashenvale to convert the Warsong clan back into a blood pact, the calm and serene forest is located directly above PURE EVIL! There’s all sorts of images in that tunnel to back up my completely logical conclusion! Look at the picture for this post! There’s a light of redemption from up high, and a spiky, rocky, fire filled cave below. That’s proof, right? Well, what about the red haze? That can’t be seen as anything but pure floating EVIL. And the cave is guarded by a Tauren named Loruk, you know what Loruk is backwards? That’s right, Kurol! Which… really… is just… as gibber-ishy I suppose. I mean, this cave has no purpose, and can only loosely be tied to anything lore-wise (A mine from when the Warsong clan first established camp in Ashenvale). The only practical use I could think of is a possible entrance to Warsong Gulch, but was changed to the Barrens at some point… I have no proof of that either. Personally, I’d like to think it’s Loruk’s fault. That cave was probably why Splintertree is so spread out over the area. They all had camp and shop set up in that cave, much safer from marauding Alliance seeking to kill innocent Hordies (that are only guilty of completely laying siege to Astranaar, and come on, that’s hardly an excuse to attack Splintertree… Go kill things at the Crossroads. No one likes that place anyway.) But then Loruk, who had eaten alot of heavy vegetation that day, excreted some… well, let’s keep this family friendly and just call it “methane” and the fetid odor drove everyone out and into the wilds of the ridiculously large trees of Ashenvale. …and before you have to ask, yes, I will eventually work my way around to blaming Tauren for everything in World of Warcraft. I’m working on a way to link Mr. Smite to Kael’thas trying to summon Kil’Jaeden at the Sunwell. COWZ R FUD NOT TANK! Posted on July 15, 2009, in Kalimdor, Oddities and tagged cave, cows, demon, hell. Bookmark the permalink. 1 Comment.